_Blast Spiderman's enemies with this fabulous two web shooting figure. Set up the target (The Lizard, natch), aim Spidey's hands and press the button on his back to fire not one but two webs straight at that arch-villain! The Spiderman web shooting action figure is motorised, so these webs really do fly out! Kids can have hours of fun recreating scenes from the new Amazing Spider-Man film, or just have fun webbin' everything in sight. The webs shoot with authentic sounds, and Spidey will turn a look as he fires his web left then right (or right then left!). You'll need 4 x AAA batteries to power his web shooting skills, as they are not included in the box. 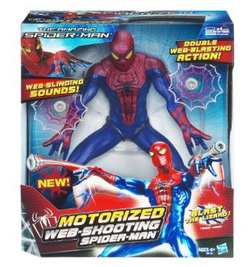 The Amazing Spider-Man Motorized Web-Shooting Figure is a must for any young Spiderman fan, or for the avid collector who likes to have fun! 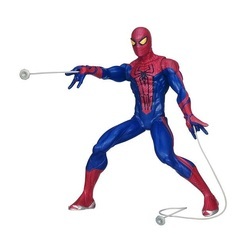 Buy your web shooting Spider Man figure at Amazon.co.uk today! two web shooters for double web-blasting action!